But is it uglier than a German SUV coupe? Crossovers are everywhere, with automakers releasing model after model of boring, high-riding SUVs. So it's a nice breath of fresh air when we see a good old fashioned sports car like the Toyota Supra instead of a boring family-mobile. But what if an SUV could be practical for a family but also sporty and cool? This is the idea behind SUV coupe models like the BMW X4, Mercedes-Benz GLC Coupe, and recently-revealed Porsche Cayenne Coupe. A rendering artist from autoreview.ru has just published his interpretation of a Toyota creation to compete against the likes of BMW, Mercedes-Benz, and Porsche. This creation is called the Supra Cross, which was named along the same lines as the Mitsubishi Eclipse Cross. Unlike the Eclipse Cross, which shares very little in common with its Eclipse namesake, this Supra Cross would likely borrow the same BMW-sourced turbocharged inline-six producing 335 horsepower and 365 lb-ft of torque. We assume power would still go out through an eight-speed automatic but to all-wheel-drive rather than rear-wheel-drive. Such a car could give the mid-range X4 M40i a run for its money, although the X4 does employ a more powerful version of the engine used in the Supra. The Supra Cross would also be down on power compared to the GLC 43 AMG but it would match the standard Cayenne Coupe. The Supra Cross is clearly just a rendering, so we have zero expectations that it will reach production. 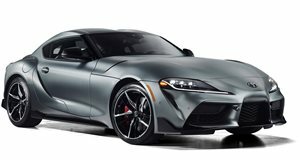 Since the Supra was co-developed with the BMW Z4, we highly doubt Toyota would be allowed to build an SUV off of the jointly-developed platform. We still think it is an interesting idea that could end up looking better than the German SUV coupes with the help of the right designer.